We had four winners on the 9-race card on Sunday, and two of our three “Key Plays of the Day ran like we thought they would. We also hit for exactas that returned $7.70, $38.00, and $8.50 for each $1 played. Not a bad day. But we are looking for more on this “Fun Day” Monday of racing at the Fair Grounds. No racing this coming Sunday on the Super Bowl. The New Orleans faithful were hoping that their beloved Saints would be playing for the Championship. And, by all rights, they should be if not for a horrendous call that cheated them out of that chance. But, such is life in the bayou. It is almost Mardi Gras time, and that cures a lot of ills. Cause a few, too, but, then again, that’s another story. 1st: 3-1/5-6-2-4…I will focus my betting strategy on the top two numbers in the day’s inaugural event, led by Lucky Andy (3). This one is dropping from a LA-bred Stakes event to the $12,500 price tag. Should appreciate the easier company and has some nice races dating back to last spring and summer. The barn hits with .21% of those in the claiming ranks and with .19% of those making the third start off a layup. Gets a huge rider switch for this one. Ruston Vow (1) will move back to facing just State-Breds only after running a game fourth against open company last time out. The rail is winning at a .19% rate at this 1-mile distance over the dirt, and this one does have 5 wins in 11 starts at this distance. Could improve with the fourth start off a layup and looks like he can stalk the lead. I bet the 3-1 across the board and then box those two solidly in the exacta. I will key the 3-1 over (only) the other numbers in the exacta, in a smaller version. 2nd: 4-9-7/1/3-5…The first grass race of the day, and I will go with Cause Me Grief (4). This is a 4YO filly by Giant’s Causeway and is trained by Steve Asmussen. Unusual to see him pair a horse up with James Graham, but that’s what happens here. The meet’s top rider had 5 winners on Sunday and could have another huge day today. This one gets a huge class drop after running poorly in an allowance last time out. Now shows up for $15,000. Work on Jan. 13 good enough and the barn hits with .19% of those away from the races this long. Spanish Angel (9) is 8-1 in the ML and could spice up the odds rack. This one ran a real good one here two races back. Never got her running shoes moving in the last. Now, gets a huge rider switch. Will be closing very late, but could grab a part of it for a trainer who has just one win in 31 starts here this meet. Untruthful Sonnet (7) gets a top rider in the irons, and ran second last time out. Barn is off to a slow start, but knows how to win. Does not have a win in 13 tries at this distance, but does have 3 seconds and 4 thirds. Underneath? I bet the 4 to win/place/show and then box the top 3 numbers in the exacta. 3rd…6-4/5-3-2-1…John Tippmann (6) looked like he was cut out to be a nice one when he started the career. Even got a run in the G2 Kentucky Jockey Club back in November of 2017. Has since now worked his way down the ladder to find himself at the $30,000 price tag today. Gets back on the dirt, where he belongs, and the barn is red hot after a huge day here on Sunday. Miguel Mena gets the call in the irons for the first time and the work here on Jan. 13 was solid. My pick. Forgotten Coast (4) is the 9-5 favorite and is the other starter from the barn of Tom Amoss. Ms. Maggie Moss had three wins on Sunday with her trainer and they team up with the meet’s leading rider again in this one. Drops out of an allowance event at Delta Downs — that hey won. Barn this with .25% of those winning the last race and with .31% of those going from a sprint to a route. Has hit the board in each of the last three and won the last out when losing the blinkers. One to beat. I bet the Amoss horses, 6-4 across the board and then box them solidly in the exacta. 4th: 1-7/8-6/4-2-5/9…The second grass race of the day will be contested at the 1-mile distance, and I will go to the rail with my Upset Special — Stealing Sunshine (1). This one is set at 8-1 odds in the ML, and may drop off that line. But gets a top rider for the meet’s top barn and is coming off a win. What more could you want? Rail is winning at an .18% rate and the barn hits with .31% of those trying the grass for the first time. Adds up for me. I bet the 1 to win/place/show and then box the 1-7 solidly in the exacta. I will key the 1-7 over/under the 8-6 in two smaller versions. 5th: 4/2-7/1-6-3/8…My first Key Play of the Day comes right here with the 6YO gelded son of Yankee Gentleman — Snapper Bite (4). This guy drops all the way to the basement for this one after spitting the bit against much, much tougher here on Jan. 5. Before that, ran a nice second in the slop here on Dec. 13. In the last out, he faced Givemeaminit — a real good one. Barn off to a slow start here at this meet, but won .20% of 191 races over the past 13 months. Should heat up soon and a top rider shows back up in the irons. Drop in company should certainly help. I bet the 4 to win/place/show and then key the 4 over/under the 2-7 in the exacta. I will key the 4 over (only) the rest of the numbers listed in a smaller version. 6th: 11/13/10-7-12-(14)-8/1-5-6-9-4…The third grass race on the card today, and my second Key Play of the Day comes with Musical Man (11). Despite the outside post, which has been most compromising all meet at this 1-mile distance, this one does have enough speed to sprint early and clear going into that first turn. Should be able to save some ground. Does have the ability to take back and rate, as well, like he did two races back. This one has hit the board in each of the last four races. Love the one at Churchill Downs on Nov. 14. Has been in some trouble in each of the last three. Gets a new rider for the first time and could graduate with a clean trip. I bet the 11 to win/place/show and then box the 11-13 solidly in one exacta. I will key the 11 over/under the 10-7-12-8 in a much smaller version, as well. 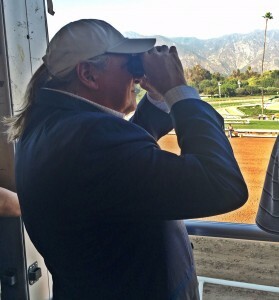 7th: 1-6-3/2-4…A nice optional claimer going 6 furlongs over the main track, and I will go with Lunar Orbit (1). This one has not been out since Nov. 24 at Churchill Downs, when he ran fourth as the PT favorite. Barn does hit with .29% of those returning as a beaten favorite, and the training session here on Jan. 21 was nice. Rail is winning at .22% rate for the sprint distance and this one should figure to sprint right to the front from this post. Good gate rider up. Break Even (6) is the 8-5 ML favorite and the one to beat. Ran a super impressive race here on Jan. 1 to break the maiden. Now, moves up to face winners for the first time. Worked well here on Jan. 20 and goes for the meet’s top barn. Will push the pace, for sure. Speed duel may ensue. I bet the 1 to win/place/show and then box the 1-6-3 in the exacta. 8th: 8/4-9-6-5/3-7-10-11…Today’s main event is the fourth and last grass race on the card, and I go strong with my last Key Play of the Day — Ginny B (8). Gets the meet’s top rider in the saddle, and this one has four “In The Money” finishes in the first 7 races. Will be dropping into the claiming ranks for the first time today, and the barn hits with .35% of those in the last 26 starts. Has been away since Dec. 7, but the work on Jan. 16 was solid and the barn knows how to win. Will be closing late and will need some racing room, but the stretch out in distance just may be the trick. My pick. I bet the 8 to win/place/show and then key the 8 over/under the 4-9-6-5 in two exactas. 9th: 7-8/2-6/1-5…Today’s finale is a bargain basement bin event for LA-breds only, and I will give a slight edge to Combat Command (7). This one ran against much tougher last out and lasted for half of it. Spit the bit and finished last, but the effort was better than it looked. Gets his second start for the new trainer today and the barn hits with .16% of those. Drops to the bottom, and the barn hits with .24% of those getting this kind of plunge in class. Like the work here on Jan. 13. Could rebound in this spot for the meet’s top rider — who had a huge day on Sunday. The one to beat appears to be Tin Roof Rusted (8). This one has run second twice in a row against these same kind. Has a win and a second in two trips over this track. Has 2 wins and a second in 5 tries at the distance. Good right now and gets another rider on the improve. I bet the 7-8 across the board and then box those two solidly in one exacta. I key the 7-8 over/under the 2-6 in two smaller ones.